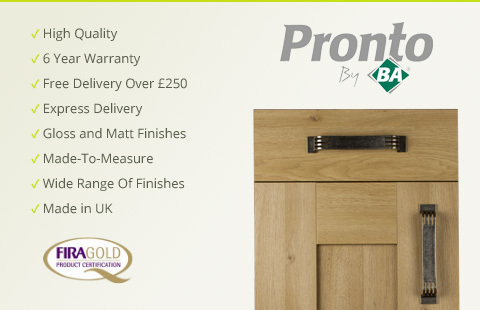 Pronto Made-to-measure and standard-sized kitchen doors from BA Components. Standard sized doors are dispatched from stock within 2 working days. The Wilton doors are 5 piece construction with each piece individually vinyl wrapped. Malton doors have the look and feel of real wood. Firbeck and Rothwell come in a modern range of tough matt and gloss finishes with Rothwell offering 22mm J groove handleless doors. Find your ideal made to measure gloss or matte finish kitchen door or kitchen accessories as part of the Pronto collection. The Wilton frames are 120 mm wide x 22 mm MDF. Panels are 6 mm thick. 110 mm, 140 mm and 175 mm high drawer fronts are single piece 22 mm MDF construction, as are 715 x 146 and 715 x 256 doors. All other sizes are 5 piece construction. 110 mm, 140 mm and 175 mm high drawer fronts have horizontal grain. Glazed doors have clear glass. Unglazed frames are rebated. The Pronto Wilton range is FSC® Certified and has attained the FIRA gold award.